Looking around the launchpad, he soon realised there were no starships at all. In their place though were six Dragonflies stationed at regular intervals along the sides. Although cool in itself, he couldn’t help but feel a little disappointed that he wasn’t about to learn to fly some kind of starship into space or beyond. Thinking more, he figured, given everything that’s happened so far, it wouldn’t be too far a stretch of the imagination to assume that it could still happen. So he’d settle for whatever this was for now and wait patiently for his ultimate daydreams. Coming out of his thoughts, he suddenly realised he couldn’t see Sarah. Calling for her, she shouted back “I’m over here”. “Where?” he responded, not able to see where the voice came from but knowing it was close. “Here I am”, Sarah said, coming around from behind a pillar. “Come see this, looks like we have to race 5 other teams across this lily pond”. Derek went over to where he saw her and moved around the pillar. In front of him was a written description and a map which appeared to show the lake. The statutory ‘You are here’ arrow pointed to our location and an ‘Exit’ pointed to where we needed to get to to move on to the next world. Sarah ran through the wheat field heading for the door as fast as she could. The last door had led to such a wonderful and fantastical adventure she hoped the next would be even better. Derek wasn’t as athletic as Sarah and could barely keep up. He knew he’d never get back to the real world without Sarah’s help. They needed each other. That said, he was at least enjoying this absolutely surreal place. Still, he could see the next door now. Sarah was calling to him while chatting to the door monitor. The last monitor was Norman, a 6-legged arachnid with a west country accent. Quite odd but not as odd as what went on when they went through. “Finally made it then Derek!” Sarah sarcastically said. “This here is Archibald but I’ve named him Archie. He’s a bullfrog.” Derek just nodded as he was too puffed out to talk. Archibald has something to tell us before we walk through but wouldn’t tell me until you arrived. “Err, Yes, my name is Archibald and I need to tell you one thing before you enter.” Derek and Sarah nodded and listened carefully to Archie. “anything else before we enter?” Derek asked. Derek sighed. Sarah opened the door “Come on Derek!” she said as she went through. Derek trudged around the door first trying to understand how it worked before walking through. Like the last one, this was a doorway in a field with nothing around it. To look at it, if you opened the door, you should step from through the door and remain in the field but you don’t. When you open the door and look through, it’s like walking into a new world. Derek hoped one of them one day would lead home. Finally stepping through, he wondered and hoped he might get a rest this time. Or at least a nice cup of tea and a chocolate Viennese. That would be nice. Closing the door as he stepped through, Derek found himself in what appeared some sort or launchpad area you might find in science fiction films with starships lined up ready to go into battle. Looking out across the ‘runway’, he could just about see what appeared to be a lake sounded by some kind of tropical rainforest. 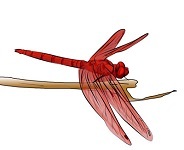 “Look”, Sarah Said, “our names are on the map.” She pointed down to the launchpad part of the map and there, written in amazingly readable scripture, was their names emblazoned with the name of their Dragonfly. Hawk Emperor. “Cool name”, Sarah added. Then ran off to say hi to Hawk with exuberant excitement. She couldn’t wait to get on top and have a go. Sarah was already in her chosen seat playing with gadgets when Derek, dragging his feet, trudgingly arrived. She stopped and looked intently at him. He looked particularly green. “Are you ok?” she asked? Derek’s face turned even greener as he asked, “So if you get eaten by a frog or sparrow, what happens to us”. The dragonfly frowned. “If I am eaten, then whatever happens to you is deserved for you have not kept me safe.” and with that he used one of his legs to flip Derek up to the seat on his back. “Sorry Derek, but I didn’t do that. I just steer. That was Hawk”. Hawk turned his head toward Derek and sneered. ‘So, it’s like that is it.’, Derek thought. As they lined up together for the first time, Sarah and Derek got a good look at the competition. It was interesting enough just to be in this Dragonfly race but both of them were looking at the other competitors to see if they could work out anything about them. Initially, they didn’t notice any other humans but a closer look spotted another team of two people in the first Dragonfly to their left. They appeared to be a man and woman in their twenties. I suspect many have a fear of flying on insects without safety equipment. Nice intro full of dreamy fantasy.